For centuries, yoga has been used as a way to achieve optimal health - both physically and mentally. With over 1 million different poses (literally!) - out there, it's hard for even the most dedicated yogi to narrow down pick a favorite. Luckily, these top NYC yoga instructors have done the work for you and picked the poses they swear by. From back-strengthening to posture perfecting, these positions will work miracles on your body. Need help nailing these poses? Book a session with these talented yogis on Romio today! "I love Bharadvajasana, a half-lotus seated twist, in which the yoga practitioner stabilizes her hips and rotates her shoulders so that the head and shoulders rotate in opposite directions. The twist stretches the muscles of the abs (internal & external obliques), hips, spine (erector spinae, multifidi), and shoulders, helping to relieve lower back pain, sciatica, and neck pain. The twist also massages the abdominal organs, improving the functioning of the digestive system. Bharadvajasana can benefit the body in many ways and can produce a calming effect on the nervous system when practiced regularly. When the spine gets a gentle twist from the sacrum, the flow of prana (life force energy) along the spine reduces stress. This boosts the parasympathetic nervous system, which is responsible for ‘rest-and-digest’, activities that occur when the body is at rest, allowing for ease and calm. And who doesn’t find the release after twist satisfying? A gentle variation of this twist done on bolsters can be great for a pregnant woman to relieve lower back pain, but should be done with caution under the guidance an expert after consulting a doctor. Most of all, I love this pose because it is dedicated to the sage Bharadvaja, whose life lesson is to find one’s passion and share it with the world." Book Yvette Jain for a private yoga session on Romio today! "My favorite go to stretch is always going to be downward facing dog! It feels absolutely amazing it’s a full body workout and I can do it even if I’m hanging out with my kids." Book Kristin McGee for a private yoga, meditation or pilates session on Romio today! "One of my favorite yoga poses is utthita trikonasana, also known as triangle pose. I love trikonasana because of its grounding and uplifting qualities. Having both of my feet planted on the floor creates stability and balance, allowing my mind to quiet. Also, because my arms are stretched out to the sides as well in trikonasana, it helps to open up my chest, counteracting the slouching from texting." 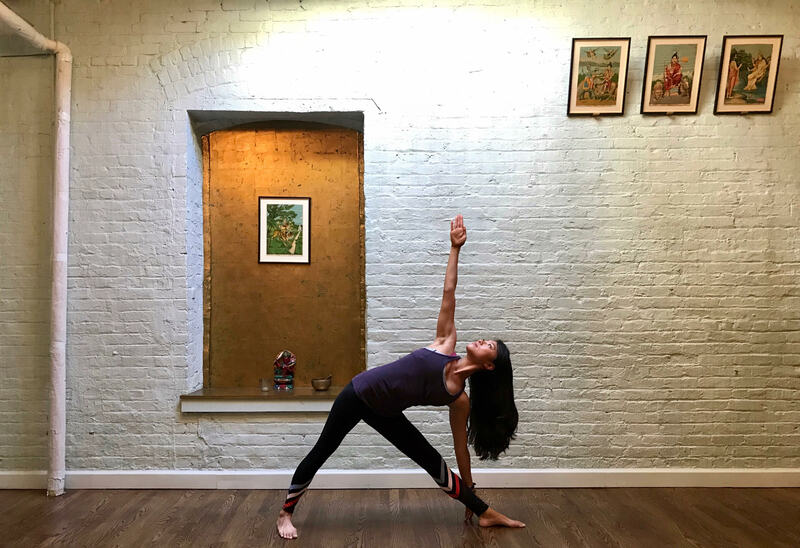 Book Stacy Leung for a private yoga session on Romio today! "If I only have time to do 1 stretch after a workout this is my go-to! It’s my favorite because it stretches my hip flexors and glutes and the forward folded version is wonderful for relieving lower back pain. If you choose to keep your torso upright (as pictured in this photo), make sure your abdominals are engaged to protect your spine. Should pigeon pose cause knee or hip pain, practice the modified version, laying on your back with the right ankle dorsiflexed and crossed over the left thigh. Thread your left hand through your legs, grabbing hold of the right hamstring." Book Dina Ivas for a private or corporate yoga session on Romio today! "My favorite pose is Half Moon or Ardha Chandrasana because it strengthens the abdomen, ankles, thighs, buttocks, and spine. It opens through the hips and chest, stretches the groin, hamstrings and calves, shoulders and chest. Half moon pose also improves coordination and sense of balance; as well as helps relieve stress and improves digestion!" Book Danielle Radulski for a private yoga class on Romio today!